The Videos - The videos are examples of executing the movements. I will continue to update and refine with the intent of presenting the best example of TCC movements as I am possible of delivering. In your personal practice and use of the videos, close all movement by returning to the resting position and pausing before beginning the next. While executing movements, you are circulating Chi, your intrinsic energy. When you pause in the suggested resting position, you allow your body’s energy to settle and balance. To become more fully trained in TCC practice, and to learn more about TCC, I highly recommend that you attend personal or group training sessions with an accredited teacher in your area. A complete listing can be found by following the link on this sight. in 1989. Your patience, sincerity, and skill drew me into the TCC community forever. Lyn Welch of Orlando, FL and Lila Margolis, of Boynton Beach, FL. You gave me the confidence boost and training needed to prepare for Teacher Accreditation. Ed Altman for your patience, caring support, and attention to detail that led me through to the next level. And Noel Altman, for her expertise and empathy. Carmen Brocklehurst for your enduring smile, kindness, insight, skill, and support. Justin Stone for bringing T’ai Chi Chih® into the world. Carl Lichtman, who helped me find my voice. My friend, Norman Kistler, who patiently conspired to move me to do what I wanted to do, and then helped me make it happen. My wife and best friend Karen, who thinks what I do is good and meaningful, and is content. My students using T’ai Chi Chih® to make a difference in their lives. Thanks to all the members of the TCC community for ongoing support, good will, and association on a daily basis, above all your willingness to provide insight and input that continues to help so I am better able to serve. On sense of humor - Having a sense of humor is not a requirement for practicing TCC. I personally think it comes in handy in whatever you do. Life is just too short not to have and use a sense of humor. If mine peaks through from time to time, it certainly is not intended to make light of TCC, the TCC community, or anyone else. I have been advised that in the past I have not treated certain subjects with due seriousness. Those advisements may have been correct. About the content provider - Accredited teachers may teach T’ai Chi Chih® (TCC). TCC was introduced in 1974 by Justin Stone. For additional information on the practice and the founder, visit www.taichichih.org. Justin Stone’s publications are available through links found on this web site. The primary content contributor for this site (Chris Norkus of Whispering Pines, NC) first studied TCC in 1989, and received accreditation to teach TCC on November 10, 2001. 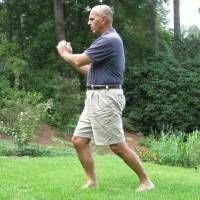 Retired from a career in telecommunications, Chris practiced and taught T’ai Chi Chih®, public speaking, and personal leadership skills. He shared with other TCC teachers a deep belief in the practice of TCC. He promoted and scheduled as much training as he is able to fit into his life. His perspective was shaped from years of practice with its impact on his personal and business life, face-to-face teaching experiences, and input from students and fellow teachers. Chris passed away in 2017.